Better Hearing and Speech Month (BHSM) is coming to a close. Originally I had planned on doing weekly linky parties, but wedding planning has gotten in the way. 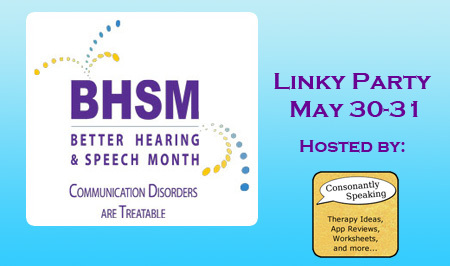 So, I am holding a 2-day linky party where speech-language pathology and audiology bloggers/material creators/businesses can link up to show what they have done for BHSM! I would love to see posts about what BHSM means to you, any materials (paid or free) that you have created for BHSM to spread the word, any blog posts showing swag you have worn to promote BHSM, etc! The only rules are it has to be related to you or your business/practice/blog as an SLP or AUD and you must provide the direct link to your post/video. NO LINKING TO PRODUCTS/MATERIALS DIRECTLY - YOU MUST HAVE A POST ABOUT THE PRODUCT/MATERIAL AND WHY IT RELATES TO BHSM (not just any product/material; must be BHSM related)! Anything that does not follow these three rules will be deleted. This can be a post about something you did this year, or a post from a previous year! Here is the image that you can use to show that you linked up to my party! I would love it if you could please link it back to this blog post (not my blog directly but this specific blog post)! Thanks for participating! I hope that those who are reading get a lot of information, inspiration, and content to use next year from this Linky Party!